Our online world has created an environment where we produce and receive a great deal of information faster than ever. While this has created many positive opportunities, it has also contributed to the overwhelm we experience, as many of us do not have the systems for taming this information overload. With digital information coming in from all areas, many struggle with how to organize that information. Often our email, files, and even our apps and digital tools, clutter up our environment and our mind, leaving us overwhelmed and unproductive. 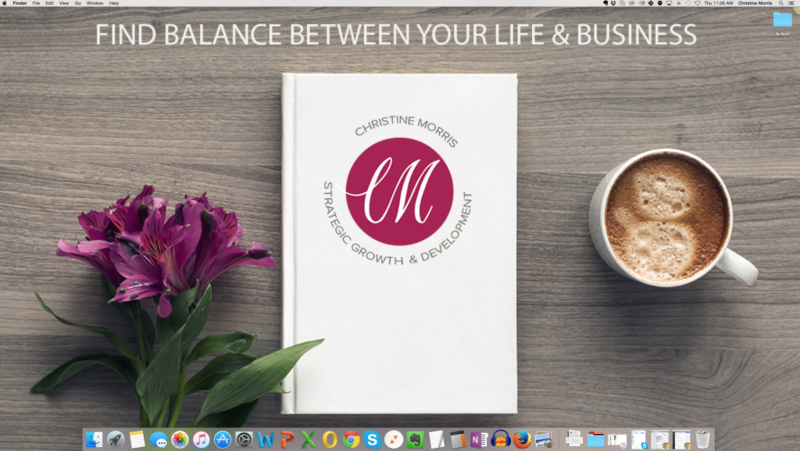 I often refer to this as digital clutter and believe that it has the same effect as physical clutter, leaving us feeling physically and mentally exhausted and hindering our productivity. I personally prefer to scan receipts, agreements, and anything else printed on paper, into my computer. This helps me to be able to keep important paperwork without creating additional paper clutter in my life. This includes digital content and training materials, ebooks, client notes, and other information that I may need (or want) to refer to in the future. However, I have to be careful that I am only saving the items that I really need or want. Otherwise, I am really just taking my physical clutter and stuffing it into my computer where it will continue to cause overwhelm. Taking the source of overwhelm and simply moving it isn’t an effective way to address or resolve the issue. Shuffling through a stack of paper on your desk and digging around a bunch of files in your computer are equally stressful and unproductive. The amount of information we have at our fingertips can be overwhelming if it isn’t managed. Do not save files to your desktop. If you download a file to use, it should be added to the appropriate file folder, preferably in a cloud-based location such as Dropbox. I don’t save anything to my hard drive. Everything is either in a cloud-based program or external storage device for rarely used information and backups. Clean off your desktop every day. If you have something that needs a home, or have a large number of files to move at one time, create a folder to move all the items into. Here is a picture of my desktop with my “To Sort” folder. Add a nice desktop photo such as your company logo, a photo of your family, or inspirational quote to inspire you. If it’s something you enjoy looking at, you might be less likely to cover it up with a bunch of files. Here is a what my desktop looks like with my “To Sort” folder in the upper right. Commit to where you will store your information. Often we are overwhelmed with the many options we have for storing files. Choosing them all is rarely the right solution. I frequently hear my clients admit that they have information in so many places, that they are overwhelmed and unsure of where their information is even stored. Evernote, Dropbox and Google Drive are some of the most frequent applications that are used, but many others exist. Where you store your information can depend on how you intend to use it, how often you need access to it, who else needs access, and how much storage you need. Create a file structure that makes sense to you and your work. Systems are only effective if you understand them and use them. Some people find that sorting by date works best for them, others organize by client or project. Again, this is going to vary depending on your needs. Configure Your Inbox to Only Show the Primary Tab. 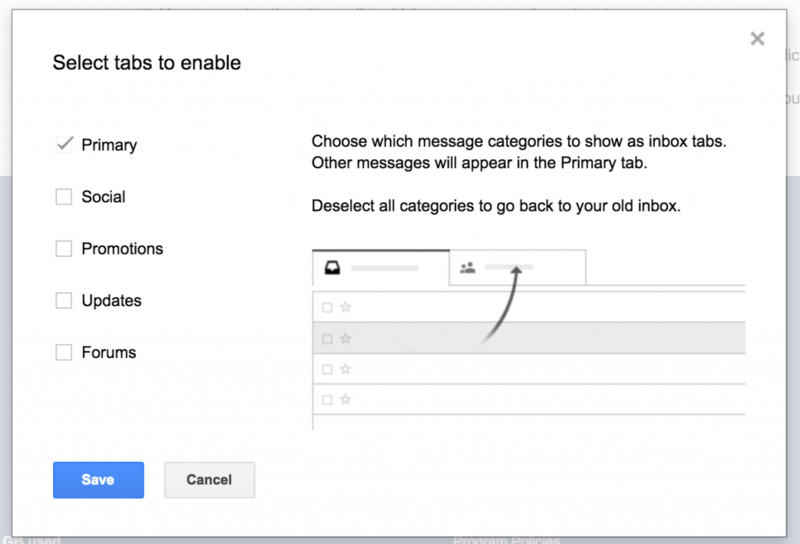 Gmail includes a feature called inbox tabs which uses different categories to organize your inbox. While this is incredibly handy, sometimes the extra tabs can become their own source of clutter and can occasionally cause important information to be sent to a promotions tab. To turn this feature off and ensure your messages are going where they are supposed to go, click the gear icon in the upper right, then click “configure inbox”. You will want to uncheck everything except primary. To read more about inbox Tabs and categories click this link to Google. Starred email. This is basically any important information I don’t want to miss, such as client emails. Waiting for (which I toggle closed and only view periodically) This is for things I want to keep on my radar and I am very careful about what goes here. Typically it includes orders I am waiting for. Everything else. This is more of my actual in box. Typically what you find there has arrived within the last 24 hours and hasn’t been addressed or moved into project management yet. Filters are what keep everything organized in my inbox. I have filters tagging email according to client names or broader categories. I also filter all newsletters to a reading folder and all shopping-related ads and coupons to a shopping folder. Both bypass my inbox and can be viewed or retrieved when needed. I would love to hear how you tame digital information overload or answer any questions in more detail on the suggestions listed above. You are welcome to leave a comment or email me directly. I also invite you to join our private Facebook group where we will continue the discussion. Learn the ONE SECRET to Get More Done, Have Less Stress, and Be More Profitable!